Italy's best melodic pop-punk band. So this is the debut of one of Italy's best rockabilly/punk bands and what a kick start it is on the path to rock and roll heaven. I would say these guys love Johnny Cash and Social Distortion very much. Cruisin on Friday nite with the top down and blastin the Peawees, thats what Im doing next weekend. OH MY GOSH! THIS ALBUM IS BACK! I HAVE WAITED SIX YEARS TO GET MY HANDS ON THIS. And it's only like $6.75! Get it now before it's out or print again! 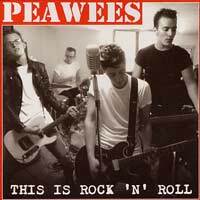 The Peawees are the greatest Rock N' Roll/blues laced Punk rock band since Social Distortion. Herve has an amazing voice. GET ALL THREE OF THEIR ALBUMS NOW NOW NOW!